Dying To Know Day is an invitation to all Australians to take action towards open and honest conversations about death, dying and bereavement and to build their death literacy. The day is inspired by the Igniting Change book Dying to Know and its creative community building approach to bringing death to life. We want to encourage all Australians to have these conversations any day, but having a dedicated ‘day’ is a way for individuals, communities and organisations to host an event, take action and make a difference. The day is designed to encourage all Australians to develop new knowledge and attitudes about how to deal with death and bereavement and support each other at the end of life and it inspires local initiatives and promotes information to enable all Australians to discuss and plan their wishes. The Day is convened by The GroundSwell Project, a not for profit organisation known for using innovative arts and health programs to create social and cultural change about death and dying. GroundSwell aims to promote resilience and wellbeing in response to end of life issues and to encourage people to build their death literacy. So…with all that in mind (plus a passion for death work! 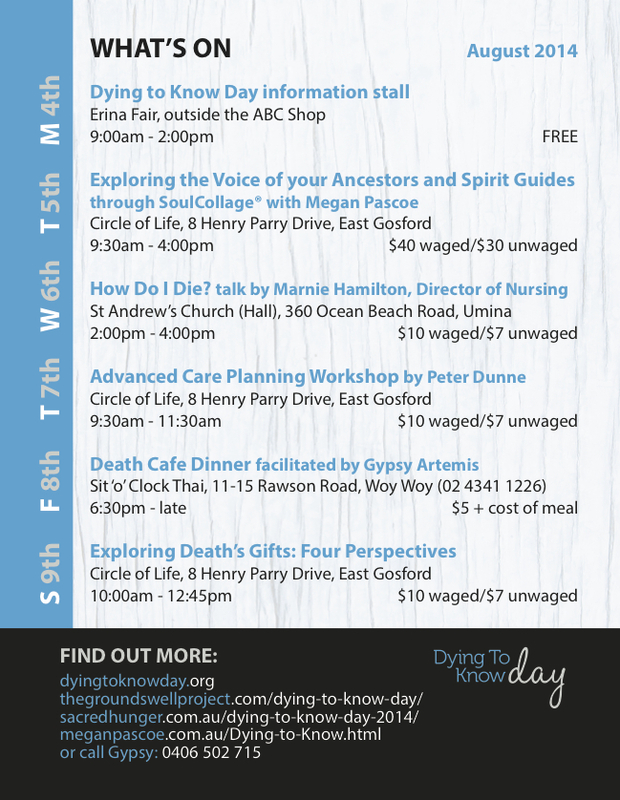 )…The Central Coast End of Life Collective, with support from The Groundswell Project, are offering a whole week of Dying To Know Day events! Yes you heard correctly! 6 awesome events over 6 days. Marnie Hamilton’s talk How Do I Die? on 6th will look at the phases of death and common medications used at the end of life. I would highly recommend this session for anyone journeying with a dying loved one. Knowledge is power folks! You’ll have the opportunity to ask lots of questions too, and Marnie has extensive experience in the area of death and dying. 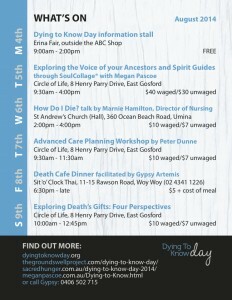 We hope to see you at one of our Dying To Know Day events.